Discussion in 'Transformers News and Rumors' started by Cyberwolf1980, Mar 4, 2008. I searched for this and picked up nothing, so if this has been posted, sorry. I found this at Walmart 2 days ago. Sorry for the terrible quality of the picture, it was taken on my phone. Found it over near the fishing equipment. Figured it was a tackle box but it's called utility box. 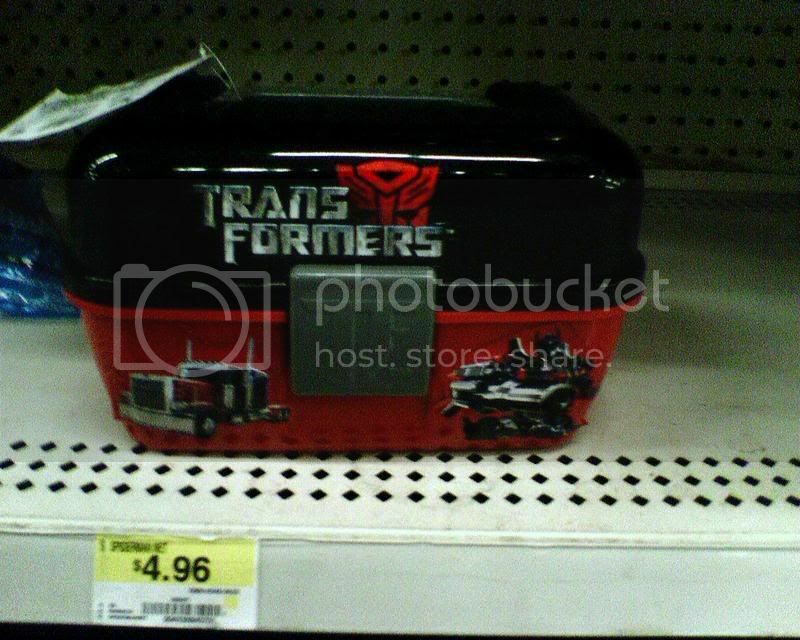 Allspark storage case? Energon cube transport? Crazy merchandise? Hey, it uses that TF logo IDW was using to promote their then-upcoming Movie adaptation comic. Looks like a good TF weapon/accessory storage box to me. Hmm, never thought about using it for that. Now I wanna go back and get one. I always feel like I'm about to lose something in my storage areas for my figures. Already tonight I spent a few minutes looking for accessories for my figures to use in my comics. That looks really cool. Hopefully I can find one. What was the price? Looks like the tag was for "Spiderman Net" so I'm unsure. I too saw that at my Wal-Mart the other night and though it would be a great weapons holder (though small for the amount of weapons I have from my collection). I would have picked it up but the price tag came back showing $13! Not worth that much. There's also a fishing pole set but it was out of stock. If I didn't like my current tackle box so much, I would be all over that. Now if I see one in NJ I will bowdown to it in the store!!! I do want one myself though!!! I like it... I gotta see if I can pick one up. Yes Indeed! The Hunt is on! Hey now thats not a bad idea, now why can't they make a play set that holds some figures too?? Now that would be cool. Never seen that before. I just use my Transformer movie popcorn tins from Blockbuster and TRU for weapons and instructions. Now that's something I don't see every day! Any Transformer related sinkers included? I could apply that to my forhead when reading the movie forum! Just picked one up today. The price was roughly seven bucks. In person it's a little cheese-tastic. It's available along with other identical small tackle-type boxes for other properties (Barbie, Spider-Man, etc.) and the only differences are the plastic colors, different molded logo on the latch, and different stickers. Yup the Transformers logo and Prime pics are all stickers, and wrinkled a bit when stuck over curved surfaces. It does look like a decent storage box for small things. like most tackle boxes, it's got a compartmentalized removable upper level for small pieces, and the bottom of the case itself accomodates larger items.